As part of the celebrations, quiz programs are organized in many schools and colleges in which you will be asked questions about Indian Independence Movement. 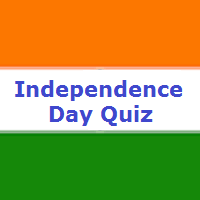 If you are a school or college student and looking for an Independence Day Quiz, then this web page is for you. Let's start the Independence Day Quiz. Remember to check the following pages for more questions related to this patriotic quiz. Who will raise the flag during national level Independence day function in 2018 at Red Fort? As per custom, Prime Minister of India unfurls the flag during national level Independence day celebrations held at Red Fort. Narendra Modi, who is the current and 15th PM of India, will unfurl the national flag on the occassion of 72nd Independennce Day. The Moplah Rebellion occurred at which place of India? The Moplah Rebellion (Māppila Lahaḷa in Malayalam) was a mass uprising in the Malabar region (Kerala) by Mappilas. The rebellion started in mid 1921 in Kerala against the crackdown of the British in Eranad and Valluvanad taluks of Malabar. Who wrote this slogan "Self-Rule is my birthright and I shall have it"? Bal Gangadhar Tilak wrote this popular quote. He was the first leader of Indian Independence Movement. He was against the Gandhi's policy of non-violence and was in favour of using force for the freedom of India. Which one was the first major battle fought by British East India company? Battle of Plassey, fought in 1757, was the first major battle won by british East India company over the Nawab of Bengal. It established the company rule over Bengal, which expanded over most parts of India during the next 100 years. East India Company started trade with India from which city? East India Company or say Britishers started trade with India from Surat. The first british ships were docked at the port in Surat and it was established as a trade transit point in 1608. During which movement Mahatama Gandhi gave the call for 'Do or Die'? Gandhi ji called for 'Do or Die' during his Quit India Speech made on the eve of Quit India Movement in 1942. What was the name of the magazine published by M.K. Gandhi? Young India was the name of the weekly journal published by M.K. Gandhi. In year 1922, he was jailed under the sedition law for his articles in this journal. What was the name of the mission sent by british government to India to seek cooperation during World War II? Cripps Mission headed by Sir Stafford Cripps, was sent to India by British govt in March 1942, to make sure that India remains loyal and cooperate with British govt during the World War II. Who was the founder president of 'Ghadar Party'? Sohan Singh Bhakna was the founder president of the Ghadar Party. Ghadar Party was founded by Punjabi Indians living in USA and Canada with the purpose of liberating India from the British rule through revolt or rebellion. Which of the following Indian freedom fighters killed a british officer in Britain? Udham Singh, a great Indian revolutionary, assassinated the former british officer Michael O'Dwyer in London. Michael O'Dwyer was the governor of Punjab and was responsible for Jallianwala Bagh Massacre. 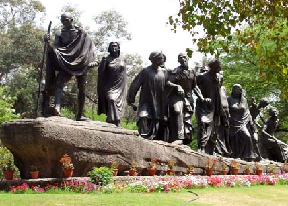 The picture shown below is associated with which movement or event of freedom struggle? This picture is associated with Dandi March or Salt March. This movement was started by Mahatma Gandi on 12 March 1930 to break the salt tax law and illegally produce salt from sea water at Dandi. Lakhs of Indians participated in this movement and it became an important event of the struggle for independence. When Komagata Maru ship returned to India, it was docked at which place? A japanese ship Komagata Maru was hired to challenge the exclusion laws enacted by Canada and to open the doors of Canada for Indian immigrants. On return to India, the ship was docked at Budge Budge ghat near Calcutta. Britishers tried to arrest Baba Gurdit Singh, fired at the passengers of the ship and 19 Indians were killed in this incident. What does the three colours of national flag represent? Our national flag consists of stripes of three colours - Saffron, White and Green from top to bottom. These three colours represent - Sacrifice (Saffron), Peace (White) and Prosperity (Green). When did Vasco da Gama discovered the sea route to India? Vaso da Gama was a Portuguese explorer who discovered the sea route to India in 1498. He landed in India at Calicut on 20 May 1498. Which of the following financial institution/bank was founded by Lala Lajpat Rai? With an aim to utilize Indian capital for the benefit of the country and to further the economic interests of the country, Lala Lajpat Rai founded the Punjab National Bank (PNB) in 1895. The bank exists even today and one of the leading nationalized banks of India. Which of the following freedom fighters was sentenced to death for his involvement in Kakori Train Robbery? On 9 August 1925, revolutionaries of Hindustan Republican Association (HRA) looted a train carrying the money of British Govt Treasury. Ashfaqulla Khan, alongwith Ram Prasad Bismil, Thakur Roshan Singh, Rajendra Nath Lahiri was given death sentence for their involvement in this robbery. 'Tum mujhe khoon do, mein tumhe azadi doonga' was said by which of the following persons? This famous patriotic slogan is attributed to Subhash Chandra Bose. He used these words in his speech for the recruitment of soldiers in INA. The rebellion of 1857 started from which city? The rebellion of 1857 was started on 10 May 1857 from the city of Meerut (U.P.). It started in the form of sepoy mutiny and soon spread in many parts of India. Who put forward the theory of 'Drain of Wealth'? Dadabhai Naoroji put forward the theory of Drain of Wealth in 1867. He stated that colonial rule was draining the wealth from India to Britain which was the main reason for poverty in India. He was the first Indian to be elected as MP to United Kingdom's House of Commons. The patriotic poem 'Sarfaroshi Ki Tamanna' was written by ? Ram Prasad Bismil, a revolutionary and freedom figher, wrote this poem. His poems was a source of motivation for his fellow revolutionaries. Who was the first Indian revolutionary to assassinate a British official in England? Madan Lal Dhingra was the first Indian freedom figher who killed a British official Curzon Wyllie in England on 1 July 1909. He hailed from Amritsar (Punjab) and went to England for higher studies. While studying there, he came into contact with noted activists like Vinayak Damodar Savarkar and was also associated with India House. Shaheed Udham Singh was another freedom figher who killed a british official in London. Khan Abdul Ghaffar Khan was awarded Bharat Ratna, India's highest civilian award, in year 1987. He was a famous independece activist during British rule in India and was known as Sarhadi Gandhi (Frontier Gandhi). This was the first time when this award was given to a non-Indian citizen. Which of the following revolutionaries threw bombs at Central Legislative Assembly in Delhi? Bhagat Singh and Batukeshwar Dutt were involved in the bombing of Central Legislative Assembly on 8 April 1929. The bombs were thrown at the empty benches to ensure that there were no casualities. The purpose of the bombing was to protest against the introduction of new bills against the trade unionism and revolutionary activities.